Articles relating to the redevelopment of St Georges Barracks published by the Parish Council. You will have received today a note from Mr Gilman at Democracy HQ ?? 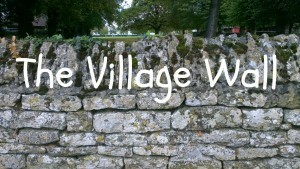 in Pilton. In it he enclosed a survey form for you to complete and return to him considering one single aspect of the RCC consultation, namely how many homes we would wish to see built at St George’s Barracks. I and the Parish Council and our SGB Working Group are working very hard to produce a sound response to the consultation on behalf of the Parish of North Luffenham. This will be produced in good time for consultation with the parishioners before the submission date of 24th September. A letter and pro forma will be circulated this week covering our response to the proposals in the plan. In addition we will be hosting a ‘Drop In’ session on Fri 14th from 7 – 9pm in the Village Hall. I am however concerned that should you choose to complete Mr Gilman’s form you may find that under the consultation rules, you are unable to respond fully to the RCC Consultation paper. Under these circumstances, parishioners of NL are recommended to ignore the circular sent by Mr Gilman and to take the lead from their elected Parish Councillors who are determined to protect the interests of NL Parishioners. This entry was posted in St Georges Barracks Development on September 5, 2018 by Paul Cummings. Please find attached an update on the St George’s Barracks Project and the work currently being undertaken by the Parish Council and NLPC SGB Working Group to try to influence RCC’s decisions. This entry was posted in St Georges Barracks Development on August 8, 2018 by Paul Cummings. I am delighted to see that North Luffenham heads the list of number of responses received, indeed almost a third of all households in the village responded, making up 21.4% of all responses. In addition, the Parish Council supported by the St George’s Barracks Working Group submitted a very detailed response that has already been published but is attached for ease of reference. Following the meeting held with our MP Sir Alan Duncan MP, on 22nd June, an Advisory Group has been formed whose purpose is to “be the voice of the community during the planning and development stage of the Project. To bring together MOD, Rutland County Council, the Developer and interested parties from the wider community of Rutland to identify issues and concerns during the Planning and Development process and to identify the appropriate and cost effective solutions.” The first meeting of the Group was held earlier this week and I was encouraged by the willingness of the County Council to engage with us as key stakeholders. I attach a copy of the Action Points arising from this first meeting. It is intended that the Advisory Group will meet every 4 weeks and may form working groups to report on individual key issues such as the environment. It has been agreed that the scale of the development and its phasing, together with infrastructure and style are the burning issues of the moment. A further group has been formed to consider the Officers’ Mess development, which we are determined should not be considered as a stand-alone development. This group will meet for the first time in the near future. We have formed a strong working relationship with EWPC and the Chairs of the respective PCs meet regularly. We are now extending this link to include Manton, Ketton, Empingham, and South Luffenham Parish Councils. This continual liaison ensures that we are in a position to understand local concerns and to speak with one voice. • The scope of the 2 x projects is remarkably similar, though Bordon can draw upon significantly more infrastructure and heritage buildings than may be available in St George’s Barracks (SGB). • The scale of the Bordon site has reduced significantly over time; the MoD threat to do their own thing was deployed by the District Council but never materialized. MoD did not significantly influence the final number of properties to be built. Final house numbers were driven in part by a report written by Natural England. • Effective and meaningful engagement between District Council and Town Council was considered essential. To achieve that a pro-active stance needed to be taken by the Town Council in making alternative positive proposals. Localism was an important influencing tool, which required continual and detailed engagement with the existing community. • Continuity and strong leadership within the Parish Councils were considered essential. The Councils should put additional effort and resources into understanding the requirements for Transport, Health, Jobs, Education, Leisure and Training. • Localism is considered an essential tool with input from all key groups. The Advisory Board might propose setting up oversight boards to consider the delivery of the promise in all key areas. • The Council should not underestimate the resources and time needed to manage a project of this size and to ensure accountability from the county Council. Once underway the project will proceed very quickly with little opportunity for review. It is essential therefore that the Masterplan is correct and has the support of all players. • Once appointed the Parish Councils need to develop close links and oversight of the work being undertaken by developers and be able to identify problems and community reaction quickly. • Developer’s Insight. This paragraph is worth reading in detail. Many of the issues/concerns raised to date with our development have materialized in Bordon. The availability of appropriately trained house-building staff may drive the overall rate of development. The majority of new buyers had to commute further to work – house sales were driven by house costs in more affluent towns/cities. • The provision of on site town sized facilities to meet the needs of the new town is a great attraction to buyers. The development needs to include a wide range of national brand shops and a range of catering outlets. A pub, an ‘Express’ store and a Pizza Hut will not meet the aspiration of buyers. A wide range of sports facilities, leisure facilities, and environmental/recreational opportunities are vital. • The on-going running costs for many of the proposed facilities, including grass cutting and leisure area management are likely to be devolved. This will result in a substantial overhead for Parish Councils. We lack expertise in planning law and planning process, if you know of anyone that would wish to join the group do please give me a call. The Group is not a protest group and seeks to influence the County Council to ensure that the proposed development is appropriate, well planned and executed and above all is “Right for Rutland’. A revised local planning document will shortly be launched by RCC. This will attempt to justify the requirement for a significant build on the airfield – please watch this space for further details. This entry was posted in Parish Council, St Georges Barracks Development on July 28, 2018 by Paul Cummings. On 22 Jun 18, Sir Alan Duncan MP Chaired a meeting to review the St George’s Barracks Masterplan. Invited were representatives of Rutland County Council, their consultants, RegenCo, the Ministry of Defence (Defence Infrastructure Organisations), County Councillors and representatives of a number of Parish Councils. Though not an official record of the meeting, which has yet to be published, please find attached a summary of the notes that I made at that meeting. My personal perceptions are included in the final paragraph of the document. The most important outcome of the meeting was an agreement to form an Advisory Group to work with RCC to help inform the Barrack Development Plan. This entry was posted in General News, St Georges Barracks Development on July 4, 2018 by Paul Cummings. This entry was posted in St Georges Barracks Development on June 15, 2018 by John Willoughby. The deadline for the submission of comments on the proposed development at St George’s Barracks has, at our request, been extended to 14th Jun 18. If you say nothing, RCC will accept your tacit support to the proposed new town of 3,570 new homes, an industrial estate and a 200 hectare quarry on your doorstep. It is really important that you have your say using the questionnaire provided or by email using the pro forma at: https://www.stgeorgesrutland.co.uk. This entry was posted in General News, Parish Council, St Georges Barracks Development on May 25, 2018 by Paul Cummings. This entry was posted in General News, Parish Council, St Georges Barracks Development on May 17, 2018 by Paul Cummings. WHAT WORTH THE WORD OF OUR COUNTY COUNCIL ?? On Friday 11th May, Rutland County Council released the first draft of the Master Plan (https://www.stgeorgesrutland.co.uk) for the redevelopment of St George’s Barracks. The event had plenty of gloss, but in reality very little substance. Certainly the group that I sat with felt that this was a lost opportunity to bring something really positive to the County. There is nothing in the plan that will attract tourism, our highest income earner, to the County. The scope of the imagination of the planners is really limited and appears to follow a commitment to cram as many houses as possible into the limited space available. The huge future quarry site which covers almost 50% of the site in the plan is termed as a “Country Park”, but you will have to live for a long time to see it. • This would be a typical Rutland village with a wide variety of houses and excellent amenities, including the development of a hotel and leisure facilities on site. • The infrastructure bid proposals were based on a development of 1,500 to 3,000 new homes (3,000 being the top estimate if the whole site was available for development). • The planning density was to be no more than 20 Homes/Hectare. I am afraid that every one of these critical commitments has been broken. 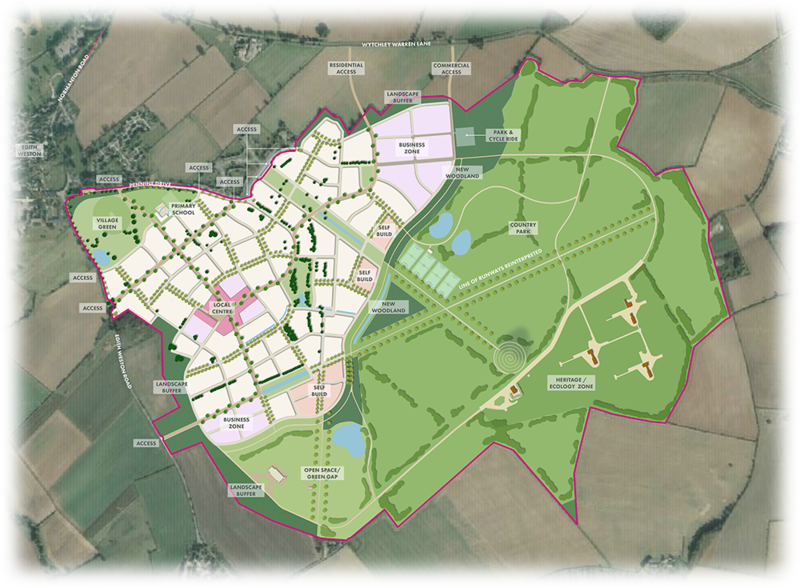 A coach and horses has been driven through these assumptions and it is now clear that the brief given to the planners was to design a new town for more than 3,000 new homes, regardless of how much land was available after the designation of the vast quarry site. As a result, though not explicit in the documentation, the proposal will include swathes of terraced homes, town houses and apartment blocks, none of which can be found in any typical Rutland Village. The proposed total density of Housing has increased from “no more than 20 Houses / Hectare” to 30 houses per hectare and in some areas considerably more. What is proposed is a new dormitory town stuck in the heart of this Rural County, that has been designed for ‘anywhere’, with precious disregard for everything that makes Rutland special. Maybe an appropriate name for the new town should be “Rutland Forsaken”. This cannot be considered to be Right for Rutland. It is therefore essential that everyone see the ‘exhibition’ in the School Hall on Wed 16th May from 6.30pm to 9pm and takes the opportunity to tell the County County Council and the ReGenco Planners what they think about their proposals. This really will affect you and your families for years to come. This entry was posted in General News, St Georges Barracks Development on May 13, 2018 by Paul Cummings. During the consultation period local communities, the wider Rutland public and key stakeholder groups are all invited to share their views on the proposals being put forward for discussion. Feedback on the high-level St George’s plan can be submitted at any point during the consultation, which runs until the end of May. Feedback forms will be available at each of the events listed above, while it is also possible to submit comments direct via the new website. This entry was posted in Parish Council, St Georges Barracks Development on May 11, 2018 by Pete Burrows. I occasionally hear some interesting views about the application of “The Crichel Down Rules” which relate to the sale of land that was compulsorily purchased by the Government post 1935. On occasion it is clear that some views do not reflect the legal reality of the situation. For ease of reference I attach an extract of the DCLG Document in which the rules are enshrined. Inevitably the document can be interpreted in different ways, however the document does explain the background and principles that need to considered. This entry was posted in Parish Council, St Georges Barracks Development on May 4, 2018 by Paul Cummings. This entry was posted in Parish Council, St Georges Barracks Development on April 19, 2018 by Pete Burrows. RCC have confirmed that consultation around the first high-level plan for St George’s will take from 11th to 27th May 2018. During this time local communities, the wider Rutland public and key stakeholder groups will be asked to share their views on the ideas and suggestions being put forward for discussion. The Annual Parish Meeting will be held at 7.30pm on Monday 16th April 2018 in the School Hall. The Chairman’s Annual Report is attached for your information and will be circulated to all homes in the village this weekend. Following the meeting the Leader and Chief Executive of the County Council will be present to answer your questions about the proposed development at St George’s Barracks of up to 3,000 new homes and a 100 Hectare quarry. If you wish to express your concerns do please attend the meeting – if you have not read it I have also attached the Joint Working Group’s Concerns papers below . This will be the last time to express your views before the County Council publish the Master Plan for the development. The development will have a huge impact on the village and at present the proposals are rolling forward with little resistance. This entry was posted in Parish Council, St Georges Barracks Development on March 29, 2018 by Paul Cummings.